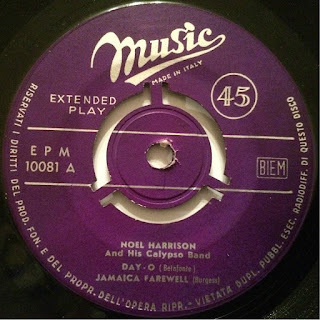 In 1959, Noel Harrison and his Calypso Band released a number of singles and an EP in mainland Europe. The four track EP was released in both Italy and Spain and featured the calypso tracks Day-O, Jamaica Farewell, Glory Mama and Watermelon Spolin' in the Wine. The tracks Glory Mama and Day-O were also released as standalone singles in Italy. The two singles are now quite easy to find and regularly come up for sale on Ebay, but because of its limited release, the EP is now one of the rarest of all Noel's records. The music contained on the EP is similar to that heard in Noel's early records, such as At the Blue Angel and At Unika. It showcases the calypso style which was popular in the late 1950s and early 1960s which Noel specialised in before he discovered the more modern sounding pop music of the mid 1960s. Introducing for the first time on this record for Spanish fans, Noel Harrison and his Calypsos Band, playing the most famous tunes of this genre. This is an extraordinary arranger and performer, a specialist in these captivating rhythms. 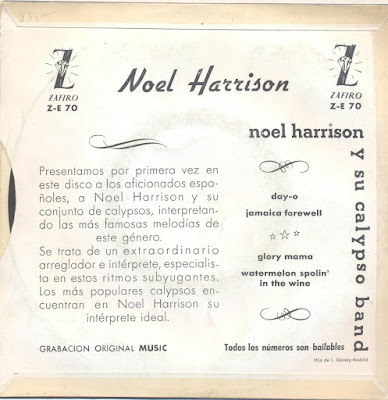 The most popular calypsos, Noel Harrison is their ideal interpreter.